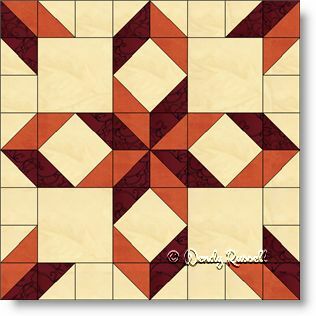 The West Virginia quilt block is an eight patch, but, as per my usual method, the pattern instructions will have you construct it as an uneven nine patch, which is an easier method (at least in my opinion). The block has lots of pieces, but none are difficult -- there are just many seam allowances to be sewn. Half square triangles are plentiful and also a few square in a square patches thrown in for good measure. The two sample quilts illustrated use standard settings of the blocks -- one on point which the other has blocks set side by side.